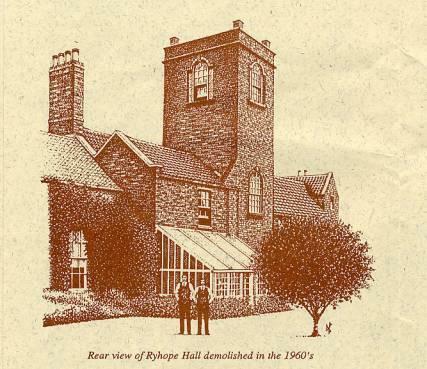 Many Ryhope old-timers may remember Ryhope Hall. Gutted by fire in the 1950s and demolished in the 1960s, its unusual brick tower was a notable village landmark for many a year. But it’s an odd-looking piece of architecture. The most popular explanation for the construction of the out-of-place item lies in the story that it was raised after an argument between neighbours. Following a heated exchange between the lady of the Hall and her former friend in the neighbouring Manor House (now Coqueda Hall), the latter was said to have built a high wall between the properties to prevent the Hall’s occupants spying on her. In response, the Hall owner simply went one better, building the tower to overlook the wall! The then tower-less Hall was originally built around 1675, and enjoyed a varied history as both a posting inn (The Three Boars Head, or something similar – sources vary) and a private residence – with lively links to a highwayman and rogue by the name of Robert Drummond in the early 1700s. In the early nineteenth century, Ryhope was a resort for sea-bathing and the Hall became popular with visiting gentry. After the railway replaced the coaches, the Hall came into the possession of the Streatfield family, owners of Ryhope Colliery. As its fortunes gradually faded its ownership passed from one hand to another – its grounds even hosting professional boxing contests in the 1950s. Soon afterwards, as it fell into general dilapidation, it was destroyed by fire, and was then demolished completely in the 1960s. The site is now occupied by local authority housing on the southern side of the old village Green. Maiden’s Paps – or Tunstall Hills, as they are less crudely and more properly called – form one of the best vantage points in the borough of Sunderland. Though little more than 300ft in elevation, the twin peaks of Rocky Hill and Green Hill offer extensive views in all directions, far beyond the expectations of those who scale their modest heights. About 2 years ago an attempt was made to hinder the public from enjoying free access to that most delightful resort - Tunstall Hill - the stile at the foot of the hill (on its southern side), being repeatedly closed with thorns - and on one particular Sunday evening, when the thorns had been removed, the bars of the stile were carefully daubed with filth, with the disgusting intention of damaging the garments of those who might unwittingly attempt to climb over. This summer another determined attempt has been made to close of the stile, but I hope the publication of this letter will be sufficient to rouse the spirit of those who, like myself, love a country walk, and induce them to clear away the obstruction. You will remember that the right of way over Tunstall Hill was challenged some years ago before the magistrates, when the bench wisely declined interfering with so clear and palpable public right. We feel that we are strictly within the line of our duty as public journalists in directing the attention of our township to an attempt which has been made during the afternoon of the last three Sundays, on the part of the tenant farmer, to exclude the public from the approach to Tunstall Road and the hill. We need hardly say that this is an illegal act, and only calls for vigorous action to be effectively set aside. The inhabitants of Sunderland have enjoyed the undisputed right of walking on these beautiful hills so far back that "the memory of man knows not to the contrary" … We understand that if these attempts should be persisted in, a number of gentlemen are prepared to take the steps needful to restore the public rights and, in the meantime, we advise our fellow townsmen to insist upon the right of way, and to remove all obstructions in the way of free ingress and egress, and thus secure for future generations the liberty of visiting the romantic locality, from which a view of our town and all the adjacent country can be obtained of surpassing interest. The whole of Tunstall Hills is to belong to the people of Sunderland. Some years ago, Sunderland Corporation purchased 39 acres of land in this area, including the Rocky Hill, for allotments, playing fields and open spaces. Now Miss E H Pemberton, of Ramside, County Durham, has offered to present to the town the remaining 7 acres of the site, which consists of the Green Hill and surrounding land. Sunderland General Purposes Committee last night was told that this was a free gift without conditions, except that the land is to be considered as a memorial to those from the town who have given their lives in the service of their country in this war. Latterly, the Tunstall Hills Protection Group has ensured the powers-that-be are kept well-and-truly on their toes when it comes to encroachment upon their green oasis – golf courses, roads and, most recently, from wind turbines. For more information (and a nice picture) see the Group’s website at http://www.tunstallhills.org.uk/ - from which the above newspaper extracts have been lifted. More details about Tunstall Hills can also be found here. This prehistoric burial mound sits atop a low prominence a few yards to the east of the busy A19 on the very edge of suburban Sunderland. Now largely ignored and forgotten it is, however, one of the borough’s most notable historical sites. Excavated by archaeologist C.T.Trechmann in 1911, it was found to be of earth and stone construction, 12m in diameter and about 1m in height – basically a chamber build into the limestone peak covered with earth and stones. The remains of ten burials were found, dating to approximately 2,000BC (late Neolithic/early Bronze Age), together with a wide selection of pottery – including several food vessels, beakers, and the like – all associated with the burials. Some bone and flint tools were also found. The finds are kept at Sunderland Museum. 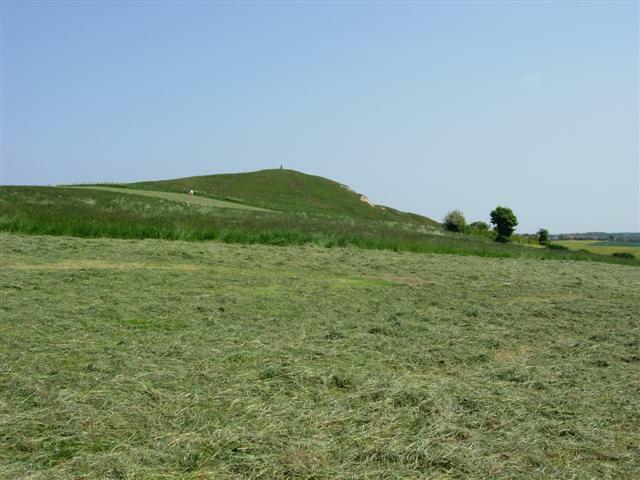 The site, in the meantime, has since had a triangulation point plopped on its top. 400m to the south-east can be found faint traces of Neolithic earthworks, indicating significant human activity in the area around 4,000 years ago. If you wish to find out more, check out here, here and here. The First Aluminium Alloy Bascule Bridge in the World. From the water colour painting by Leslie Carr, published in “Light Metals,” December, 1948. … A ‘bascule bridge’ being one that opens from the middle upwards, much like London’s Tower Bridge. Can’t say whether the aluminium version ever caught on, though, and I’d be interested to learn if anyone out there knows. The Hendon model certainly didn’t last long: opened in 1948, it was reported as being in a poor state by the 1970s – and I have been unable to discover when exactly it was dismantled and sold for scrap. If anyone has anything to add, please comment below. 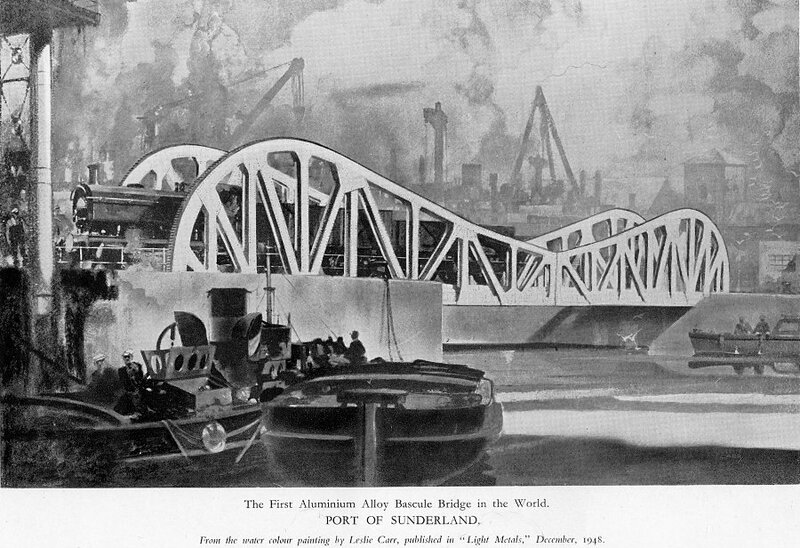 In the meantime, there is an excellent article about the bridge about half way down the page, here, where one will find many more images and locational plans and maps. The largest catastrophe of its kind ever to take place in the UK occurred on 16th June 1883 in Sunderland, when 183 children died of asphyxia at the base of a stairwell in the town’s Victoria Hall. 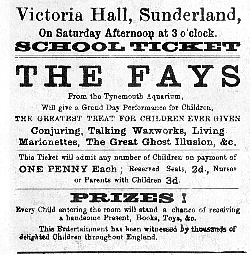 Tempted by The Fay’s travelling entertainers from Tynemouth Aquarium, upwards of 2,000 youngsters descended on the now long-gone theatre which used to stand on the junction of Toward Road and Laura Street, overlooking Mowbray Park. The variety show was a magnificent success, until its tragic finale – the children having been royally entertained by the show’s many tricks and illusions. At the end of the afternoon’s antics, with the audience at fever pitch, the much anticipated hand-out of free gifts commenced – a random process for the most part, though specially numbered tickets had precedence. As those in the stalls began benefiting first, a certain amount of confusion and panic spread throughout the gallery as those in the upper reaches of the theatre feared they would miss out. Keen to collect any gifts on offer – a rare treat indeed for youngster of the day – the 1,000 or so children began swarming downstairs – to be met with a partially bolted door and no way of escape. Reports as to how the situation arose – and who was to blame – differ wildly. The net result was indisputable, however, as a massive crush – some say as much as twenty bodies deep – ensued. As the few adults present tried desperately to release the locked doors, the children kept on piling in from the staircase above. By the time the doors were finally ripped from their hinges, a total of 183 youngsters had perished in the writhing mass – 114 boys and 69 girls, almost all of them between seven and eleven years old. Some families lost three or four offspring – and one entire Bible Class of 30 from a local Sunday School was wiped out. The national outcry which followed resulted, directly, in the passing of new laws that required all public venues to have a sufficient number of exits, and that all exit doors must open outwards – which led to the invention of the now familiar ‘push bar’ emergency door. Wikipedia (good list of further sources). Joseph Cawthorne, or ‘John the Pieman’, was a well-known character of mid-nineteenth century Sunderland – more especially for the way in which he would sell his goods. When a customer approached, they were required to put a penny down on a tin lid and ask: “Heads or tails?” If John guessed right, he took the penny and gave them no pie; but if he guessed wrong, they got their penny back and a pie into the bargain. “I am the only man in Sunderland who fought at Waterloo,” he would claim – a boast sustained by medals he occasionally wore on his breast which proved him to be a veteran of the great battle, and of the Peninsular War. 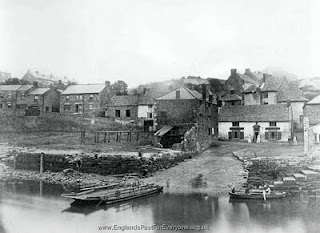 Cawthorne, it seems, was born on 29th August 1790, at Newark-on-Trent. At 14 he was apprenticed to a canvas weaver, but was hardly out of his apprenticeship when he joined the Montgomeryshire Militia, and thereafter the first battalion of the Rifle Brigade. In the Peninsular War he fought at Vittoria, the Pyrenees, and Toulouse, among others, during which time he was wounded once. At Waterloo in 1815, he was wounded again, this time more severely. After returning to England, he continued in the service of his country until his discharge in about 1819. He got no pension, and for some unknown reason eventually found himself in Sunderland, where he took up his living as a pieman. In his late 60s, efforts were made to get him a small pension, and sixpence a day was awarded; which was increased to 9d in 1863, and in 1866 to a shilling a day. 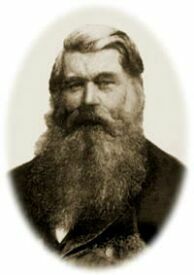 The old man died in 1869, aged 78. If you could stop your car on the busy A19 dual carriageway at the point where it crosses the River Wear and peer over its eastern edge into the valley below, you would be staring at the exact spot of the long-gone Hylton Ferry. The old ferry – and the ford which pre-dated it – used to carry traffic using the original main Sunderland-Newcastle road, in the days before the ‘modern’ bridges which span the river a little downstream. It is difficult to believe it now, but it’s true – and in fact despite being superseded by the Queen Alexandra and Wearmouth Bridges from the 1790s onwards, the old ferry itself didn’t disappear completely until the 1950s. The last ferryman – Charlie Darby – died as recently as 2002, aged 99. The earliest reference to a ferry on the site is in 1322, when Robert, Baron of Hilton, granted to his chaplain, William de Hilton, “the passage of Bovisferry” – in other words, a means by which cattle could be transported across the river. Quite what forms this ancient ferry assumed over the centuries no one will ever know, but by the eighteenth century it seems to have been assisted by a guide-rope stretched across the river to prevent it from being swept down on the tide at certain times of the day. In the nineteenth century it became known as the Horse Ferry, and it developed into a flat-bottomed boat operated by way of a chain windlass – the chain lying on the river bed, and the whole thing being wound by hand. You can get a pretty good idea of how it looked from the picture below. Most sources have the chain ferry being dismantled around 1915. But despite this – as well as the coming of the bridges and metalled roads – dear old Charlie Darby kept a ferry service of sorts going for as long as he could, until his boat was pulled from under him fifty-odd years ago – and another ancient way of life passed into history. For further information see here, and here (lots of pics! ).